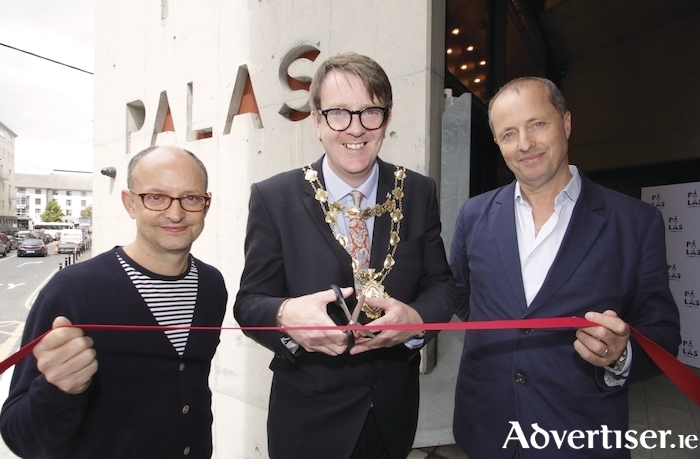 Elements Pictures's Andrew Lowe hopes Galwegians will "appreciate and embrace Pálás for what she is, a unique cultural venue for all"
The Pálás was officially opened on Wednesday afternoon by the Mayor of Galway City, Labour councillor Niall McNelis, who said he hopes the art house cinema will be "an attractive meeting place for the people of Galway". Mayor McNelis officiated the 'cutting of the ribbon' ceremony to mark the occasion. He said: “I always supported this venture. I was there on the day that Michael D Higgins cut the ribbon to open the site and I’m delighted that this beautiful venue has come to fruition." The building houses three-screens and a bar and restaurant. It screens feature films, shorts, classics, foreign language and animated films, feature length documentaries, and hosts special events and festivals. The Pálás is run by Elements Pictures, led by Ed Guiney and Andrew Lowe. At the opening, Mr Lowe said the building was "a credit to the skill and care" of the design team, led by Tom dePaor and contractors JJ Rhatigans, and their team of sub-contractors. He also acknowledged the "passion, commitment, and collaboration of Lelia Doolan and her colleagues in Solas" who initiated the project and "brought us in to operate and complete the construction phase". He added that he hoped Galwegians would "come to appreciate and embrace Pálás for what she is, a unique cultural venue for all".